In the cold, far east of Europe, there is a country that borders Poland and Russia. Its history of Varangian tribes, Viking rule, and Russian occupation has made for a unique country. This nation, Ukraine, is also home to many revolutionaries. The Euromaidan started with a few people in Maidan Nezalezhnosti, protesting then-president Yanukovych’s resistance to signing the Association Agreement with the European Union. The young people of Ukraine wanted the country to begin looking West, toward the rest of Europe and America. But Yanukovych wanted to remain close to Russia. The demonstrations began on November 22, 2013 with only a few hundred students. It became clear, though, as the first night turned into day, with demonstrators remaining, that this would not be a fleeting event. 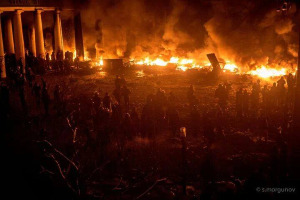 A little more than a week after the demonstrations began, one night in particular put Euromaidan in the world’s eyes. In the early hours of November 30, at around four in the morning, Berkut special forces were deployed against the protesting students with instructions to “clear” Maidan Nezalezhnosti. Multiple cameras captured photos and videos of the horrific bloodbath that followed. When the world saw what had happened to the peaceful objectors, anger flared at Yanukovych. The first mass demonstration happened shortly after the attack. On November 31, an estimated 700,000 people showed up in Ukraine’s capital, Kiev, and more people protested in other areas of the country. On December 11, at one am, another surprise attack occurred. This encounter was a success for the students after a three-hour standoff with the Berkut forces. Euromaidan leaders, including pop singer Ruslana, were seen telling the crowd to remain calm. Even after the attempted removal of protesters by the authorities, 15,000 people stayed all day and a few thousand remained through the night, too. Daily life in Euromaidan became that of a small city. There were morning prayers, speeches, and musical performances, and protesters took on various jobs, like guard duty, running the electronics division, and writing for the newspaper. Something like a small country had formed in the heart of Ukraine. The people of Maidan Nezalezhnosti even had their own government while fighting for a better Ukranian one. Euromaidan drew to a close in March of 2014 when Yanukovych finally resigned as president. Joyous celebrations took place across the country, and news headlines around the world read that the standoff between the people of Ukraine and their government had come to an end. What can we learn from these young revolutionaries? Could it be how young people can come together to change an entire government? Could it be the effect of self-organization or how a group of people can stand up to an authoritarian government? More likely, it is how the human spirit will withstand bullets and bombs, Molotovs and hypothermia, to stand up for what is right.